Inner Ear is once again embarking on a journey north of our studios in Glasgow to deliver a special workshop all about live streaming, in partnership with Honeycomb Creative Works. After a successful and well received day’s session in Fort William earlier in the year, Inner Ear is now taking it’s live streaming expertise up to Stornoway on the Isle of Lewis on Thursday 9 April. As part of this day-long workshop on live streaming in the Caladh Inn in Stornoway, we will cover end to end process, online platforms, technical knowhow and all you need to know to set up your own live streamed event. 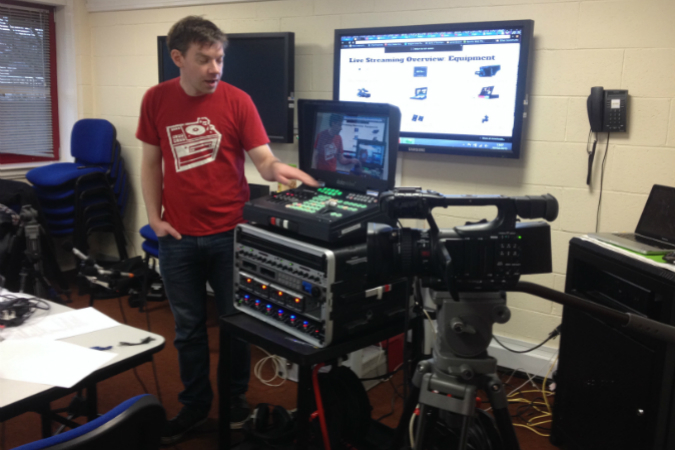 Our technical team will be on hand all day to answer questions and take workshop attendees through any specifics of live streaming they are interested in finding out more about. Inner Ear is also live streaming the Donald MacLeod Memorial Piping Competition in Stornoway on the Friday 10 April and will invite interested attendees of the workshop to join us behind the scenes of the event for a unique ‘hands on’ production experience. The live streamed competition will be broadcasting to audiences all over the world, taking place in the same venue as the previous day’s workshop and providing attendees with an insight into our live work. This workshop will draw on the company’s years of expertise in this field, having produced live video streams for events such as Sound To Sea, the elaborate evening of live music, fireworks, aerial dance, live visuals and more all on the historic waters of the River Clyde and various international piping competitions such as the World Pipe Band Championships on Glasgow Green and the Glenfiddich Piping Championships in Blair Castle in Blair Atholl.